Surely improving your skin is on your list of new year’s resolutions, right? And, more than likely, you’re still doing your research to find the best beauty routine and the perfect products. If you’re jumping on the 10-step skincare routine bandwagon, or a version of it (because who has time for 10 steps? 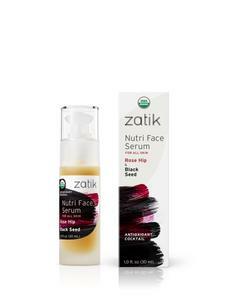 ), then I have a couple of organic serums to recommend: Zatik Naturals Relieve Eye Serum and Zatik Naturals Nutri Face Serum. Zatik Naturals is a brand of organic products that are pure, with no synthetic chemicals added ever. It relies on organic sources, such as plant extracts, that are potent, bio-renewable, and are non-GMO. Think of Zatik as super foods for your skin. An eye brightening antioxidant cocktail formulated with pomegranate, the Relieve Eye Serum is a lightweight product that absorbs easily beneath your eyes, targets those bothersome lines and wrinkles, and restores an overall youthfulness to your peepers. I like it because it blends well beneath my concealer and/or foundation. To me, that’s super important. Some under eye products cause my makeup to cake. 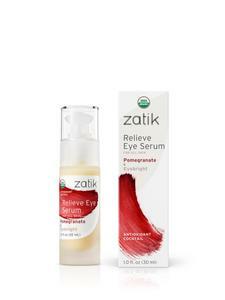 Zatik Naturals Relieve Eye Serum does not. I use it day and night. It also works well with my other skin products, like beauty oils and moisturizers. Plus, I found a second use for it, and I adore products that give me a two-for-one. Try using Relieve Eye Serum nightly on the back of your hands. I found a significant improvement in the suppleness of my hands when I started doing so. Now, what I really love is Nutriface Serum. This has to be the gem of the Zatik Naturals’ product line. Formulated with Rose Hip and Black Seed, this product packs a punch! The black cumin seed oil is composed of essential fatty acids that smooth the appearance of wrinkles. And while the brand doesn’t claim this, I feel like it plumps my skin—not in a fat-face kind of way, but rather in a youthful kind of way. If that makes sense, like a bit of a baby face. And, as is the case with the Relieve Eye Serum, Nutriface Serum works well with my other skincare products, concealer, foundation, and finishing powder. That’s really, really important to me. Aside from its skincare, Zatik Naturals has a whole collection of healthcare, hair, and body products, too. So if you’ve been on the hunt for nourishing organic products for you and your whole family, this is a brand you will want to check out. Shop it online at ZatikNatural.com. You can also shop in-store at a Whole Foods near you. Use this Store Locator to find a retail outlet that offers Zatik Naturals.